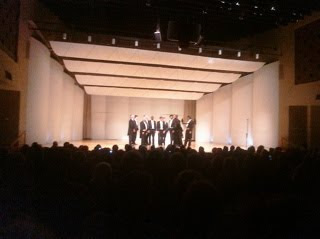 Monday we were at the acoustically very nice Armstrong Hall at Shenandoah University in Winchester, VA, where the audience was very enthusiastic. 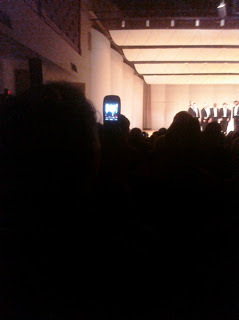 We invited them to tweet and photograph during the last number - something we did for the first time during our National Youth Choral Festival in Davies Hall last March. On Tuesday we moved on to Cooksville, Tennesee where we patronized the Waffle House this morning before our mid day masterclass. Tonight we'll be performing in Wattenbarger Auditorium at Tennessee Technological University. Brian and Gregory - who come from these parts, more or less - will have family in attendance.